The first three years of life are the most important for human development. 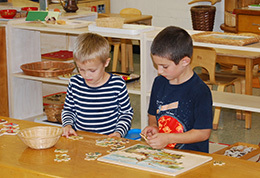 Children in the Young People’s Community at LMS grow in a nurturing environment filled with fascinating and beautiful materials, specially sized for their smaller hands, that encourage their natural desire to explore and that promote their curiosity. 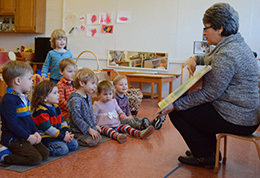 Our toddlers play under the watchful eyes of nurturing teachers, who make appropriate changes in the classroom to support each child’s development. Whether practicing how to pour from a pitcher, singing a numbers song, preparing food, washing and sorting, experimenting with color mixing, or storytelling, our toddlers’ work is joyful and purposeful.